One of the biggest trends disrupting retail today is the rise of voice assistants such as Amazon Alexa and Google Assistant. While relatively new, these technologies are gaining popularity fast, with voice-controlled devices like smart speakers quickly becoming a staple in American households. But it’s not just retailers that are feeling the effects of this trend. New research indicates that voice assistants are also becoming a major disruptor in the consumer packaged goods industry. In this post, we’ll highlight recent reports that emphasize the importance of voice as a channel for today’s CPG brands. The popularity of voice-assisted devices increased rapidly last year, with Q4 sales growing 103% year-over-year. According to Juniper Research, there are now 450 million of these devices in the United States, a figure that’s expected to reach 870 million by 2022 — an increase of 95%. Smart speakers in particular, such as Amazon Echo and Google Home, will be in more than half of all U.S. homes within the next four years. 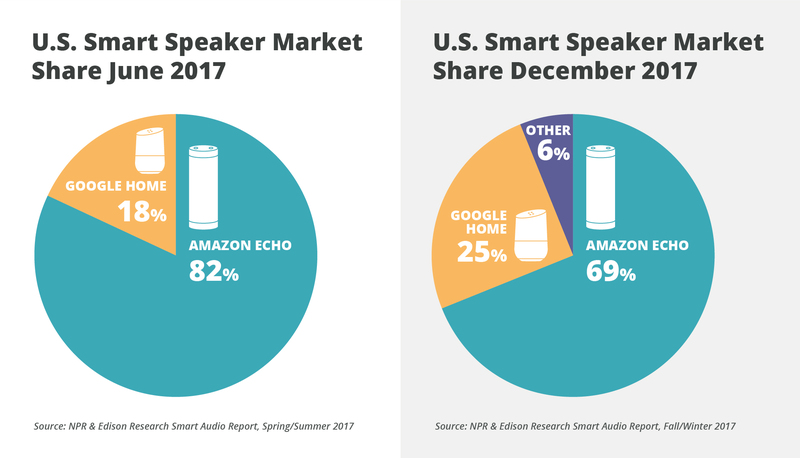 When it comes to which types of smart speakers consumers are leveraging most, Amazon continues to dominate the market. According to Voicebot.ai’s analysis of NPR and Edison’s most recent Smart Audio Report, the Alexa-powered Echo speaker has an almost three-to-one consumer market share advantage over the Assistant-powered Google Home. The gap between the two giants narrowed considerably in 2017, however, ending at 69% and 25%, respectively. This is the first time Amazon’s market share has dropped below 70%. NPR’s original version of the Smart Audio Report, released in June 2017, found that 57% of smart speaker owners had ordered an item through their device, and 31% had spent more money on Amazon and Google Express since getting their speaker. Today’s retailers are actively responding to these trends; according to a recent survey, mobile voice search (voice search on mobile web/app) and desktop voice search (voice search on website) are being added by more retailer respondents through 2018 than any other technologies cited. Retailers are also investing heavily in voice assistant integrations, such as Alexa Skills and Amazon Apps. 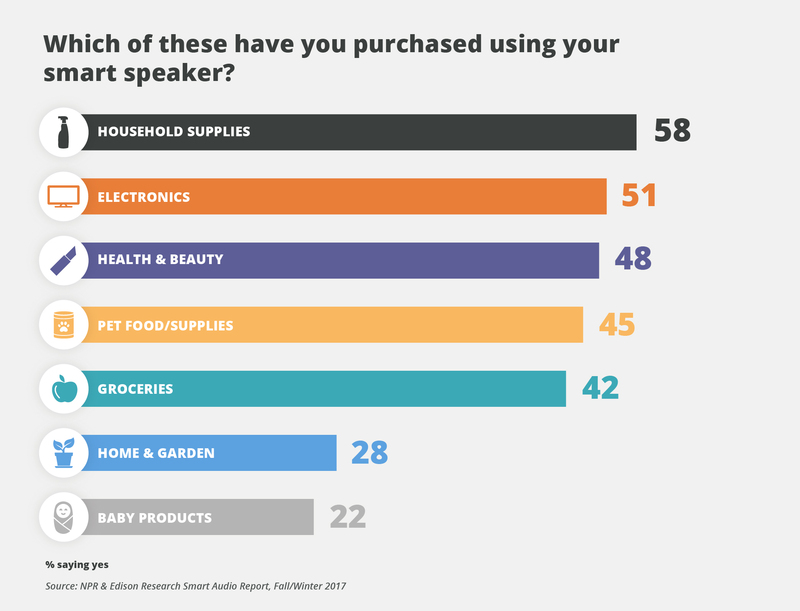 NPR’s most recent Smart Audio Report also revealed the types of products most frequently purchased using smart speakers. This data points to a significant advantage for brands operating in the CPG space: The most popular categories include household supplies, health and beauty, pet food and supplies, groceries, and baby products. Last month, a study by Linc Global and Rakuten, cited by CNBC, found that Amazon’s Alexa voice technology is helping consumer brands sell more. According to the report, Amazon Echo owners increased their purchases of consumers goods by 13% in the third quarter of 2017, up from the 7.5% increase seen in Q2. The data also revealed an unusually high upsell rate of 60%, meaning that consumers bought more products from the same brand after purchasing an Echo speaker. "This study indicates that voice search has a positive impact on sales of standardized products. Alexa's voice platform provides a powerful marketing channel for brands to sell direct." In a July 2017 article for WayfinD e-magazine, Lee Petersen, Executive Vice President of Brand, Strategy and Design at WD partners, discusses how Alexa is creating increased brand agnosticism in the CPG space. Because Alexa is largely in control of customers’ purchasing processes, determining how, where and what shoppers buy, the influence of brand names is largely being replaced by convenience factors such as price and delivery speed. "Alexa is ushering in a future when brand parity reaches its inevitable conclusion. If you’re the brand manager of a CPG product, this existential threat should shake you to your brand-loving, MBA-trained core." The proliferation of voice-controlled devices offers a major value-add to retailers and brands, who now have a direct and easily accessible line into consumers’ homes and day-to-day lives. 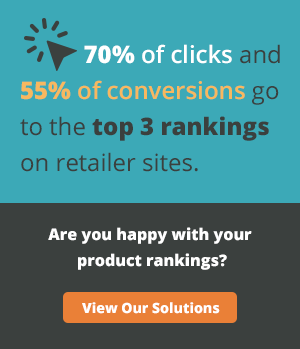 But it also presents a host of new challenges, particularly for established CPG manufacturers who are just now beginning to master the difficult art of marketing for the digital shelf. Is your brand having trouble preparing for this new era of voice commerce? Contact OneSpace today to see how we can help.